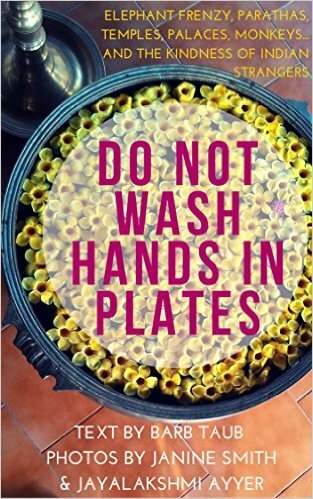 #Bookreview Do Not Wash Hands in Plates by Barb Taub (@barbtaub) #Indiatravel A fun trip with friends, elephants, food and more food. I must confess I’m partial to stories of female friends. We don’t choose our family, but we choose our friends (or are chosen by them) and however different we might appear to be, there’s a synergy that takes place when good friends get together, that makes the time spent apart melt away, and the clock turn back. In this travelogue, the author recounts the memoir of her trip to India with her two friends, Janine and Jaya, revisiting an experience they shared thirty five years before. Only, this time they’d gone one better, and rather than meeting in Europe, they decided to visit their friend Jaya at home, in India. Obama learnt about this and decided India must be worth a visit too, and at the beginning of their trip, the three friends have to do some interesting manoeuvres to avoid getting caught in the maelstrom the visit has caused. But there are some pluses too (Taj Mahal has never been cleaner). Barb Taub’s voice is funny, fresh, witty (I love IPS as an Indian travelling guidance system, but I’ll let you discover it by yourself), and she does not take herself, or the experience, too seriously. The reader goes along for the ride and feels one more of the party. There are no lengthy descriptions or heavy facts enumerated. The book is mostly a collection of impressions, discreet episodes, funny anecdotes, vibrant encounters with people (yes, and some elephants), and food. Lots of food. It isn’t a book to be read to find advice on how to travel to India (the author’s experience is unique, and the product of very specific circumstances), although if we are to extract any recommendations from her adventures, it would be that it’s handy to travel with friends that know their way around pills and medication. And that if you manage to keep an open mind and forget about rigid schedules you’ll have a hell of a time. If I had to find any buts with the book, yes, it’s short. Very short, although that perhaps contributes to the feeling of dynamism and effervescence of the reading experience. The author explains the difficulties with including pictures in an e-book and offers a link to have access to the pictures in better quality (and to videos and images not in the book) although in an ideal world readers might like to organise themselves to have access to the pictures as they read the book. (Or perhaps consider a paper copy, although as I haven’t seen one, I can’t comment on it). The other thing I missed was the opportunity of getting to know more about her friends (well, and her!). As I said before, books about female friends are my weakness, and not having read the author’s previous adventures I missed a bit more background. A great little book for anybody who likes funny anecdotes, comments about food (beware of reading this book if you’re hungry, you might eat it! ), hilarious adventures and a great narrator. I hope the three friends start a business organising trips soon! Thank you so much Olga! What a wonderful, funny, and completely flattering review. I’m constantly surprised—given my graphic description of close personal encounters with the Indian medical system, plus the whole…er… non-western toilet issue—that so many people ask to travel with us. I admit that the food is fabulous, but the results are scary predictable. Thanks, Barb. I’m aware your book had been on my list for a while but I managed to volunteer for some extra reading in the meantime (because, of course, I didn’t have enough books to read!). But for me it was well worth the wait. What a fun read! I really wanted to have some Parathas as I was reading. You should distribute books to Indian restaurants… They’d do well. I’d happily join in a trip (I’m a doctor too, although mostly worked in psychiatry… I wonder if that would help or hinder).